I got back from Fort Myers Beach, where I did a bunch of sketches. The weather was fabulous and there were many interesting subjects. I will be sharing those this week on my blog. 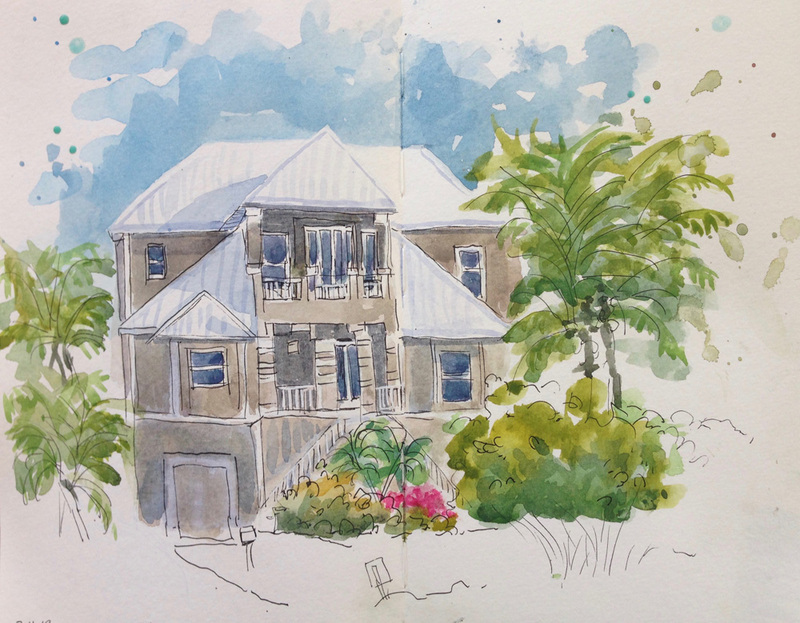 The one I am sharing today is of a house I sketched. I stood on the beach near an open lot, looking back towards the house—you can see it in the photo. I liked the architecture and design. I worked a little differently than usual— I lightly sketched the major shapes with a light blue pencil, then used watercolor to fill the main shapes. I liked this way of working— it kept things looser than my usual way of sketching with pen first then putting in color. I began doing light washes in watercolor next, and slowly the sketch started coming together. My next steps were darkening values, deepening shadows, adding more details, spattering paint a little more, and using more pen work and polishing the final steps. This was great fun, although I stood the whole time and was getting sunburned on my legs. The hazards of urban sketching!